American Rhododendron Society – the parent society for many associated clubs and societies nationwide. American Rhododendron Society (ARS) District 1 – the BC chapters of the ARS. Hirsutum.info – The Hirsutum Project is a new website with thousands of rhododendron and azalea pictures. Meerkerk Rhododendron Garden – Whidbey Island, Washington. Take a tour of the gardens, viewing different sections with various species. A scenic page with many photographs, interesting commentary. All about rhodos and azaleas by the Hennings – a great place for general information on these plants for the general or novice gardener. 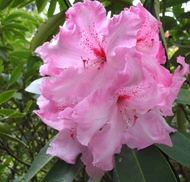 Rhododendron Species Foundation – dedicated to conservation and education with their garden. Includes a plant distribution catalog and list of recommended books for all levels of rhodo growers. Rhododendron and Azalea News – links to the newsletters of The American Rhododendron Society. Rhododendrons International – an online rhododendron journal not associated with any existing rhododendron organization (but supported by all existing organizations) that presents articles in English on any aspect of rhododendrons that are perceived to be of wide interest to rhododendron enthusiasts world-wide. Edited by MARS’s own Dr. Glen Jamieson.